Azure Files is Microsoft's easy-to-use cloud file system. Azure file shares can be mounted in Windows, Linux, and macOS. 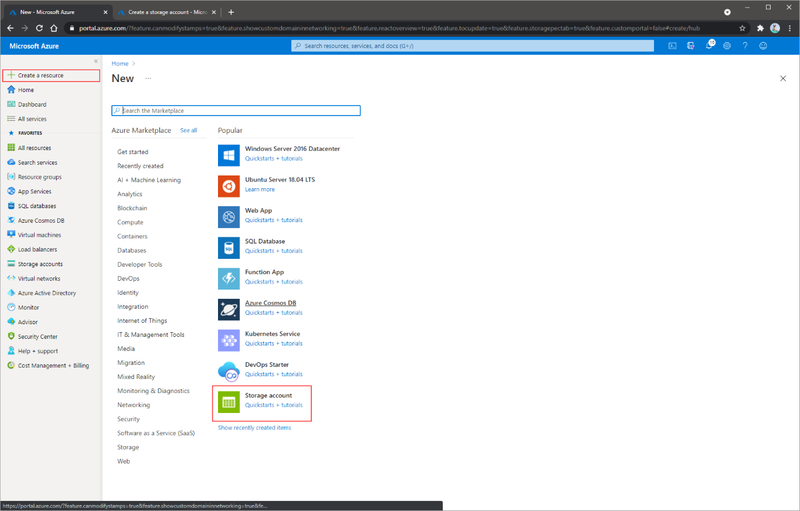 This guide walks you through the basics of working with Azure file shares using the Azure portal. 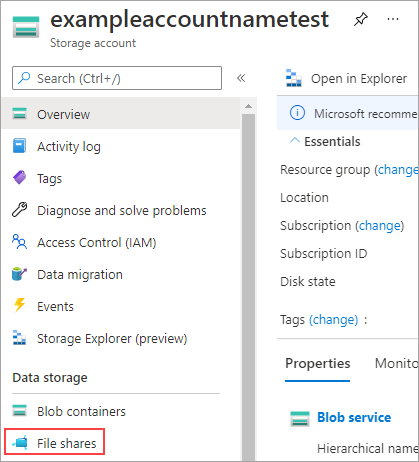 A storage account is a shared pool of storage in which you can deploy an Azure file share or other storage resources, such as blobs or queues. A storage account can contain an unlimited number of shares. A share can store an unlimited number of files, up to the capacity limits of the storage account. In the left menu, select + to create a resource. In the search box, enter storage account, select Storage account - blob, file, table, queue, and then select Create. In Name, enter mystorageacct followed by a few random numbers, until you see a green check mark that indicates that it's a unique name. A storage account name must be all lowercase and globally unique. Make a note of your storage account name. You will use it later. In Deployment model, leave the default value of Resource Manager. To learn more about the differences between Azure Resource Manager and the classic deployment model, see Understand deployment models and the state of your resources. In Account kind, select StorageV2. To learn more about the different kinds of storage accounts, see Understand Azure storage accounts. In Performance, keep the default value of Standard storage. Azure Files currently supports only standard storage; even if you select Azure Premium Storage, your file share is stored in standard storage. In Replication, select Locally redundant storage (LRS). In Secure transfer required, we recommend that you always select Enabled. To learn more about this option, see Understand encryption in-transit. In Subscription, select the subscription that was used to create the storage account. If you have only one subscription, it should be the default. In Resource group, select Create new. For the name, enter myResourceGroup. In Location, select East US. In Virtual networks, leave the default option as Disabled. To make the storage account easier to find, select Pin to dashboard. When you're finished, select Create to start the deployment. Select the storage account from your dashboard. On the storage account page, in the Services section, select Files. On the menu at the top of the File service page, click + File share. The New file share page drops down. Click OK to create the Azure file share. Share names need to be all lower case letters, numbers, and single hyphens but cannot start with a hyphen. For complete details about naming file shares and files, see Naming and Referencing Shares, Directories, Files, and Metadata. Azure Files provides two methods of working with files and folders within your Azure file share: the industry standard Server Message Block (SMB) protocol and the File REST protocol. All requests made via the Azure portal are made with the File REST API enabling you to create, modify, and delete files and directories on clients without SMB access. It is possible work directly with the File REST protocol directly (that is, handcrafting REST HTTP calls yourself), but the most common way (beyond using the Azure portal) to use the File REST protocol is to use the Azure PowerShell module, the Azure CLI, or an Azure Storage SDK, all of which provide a nice wrapper around the File REST protocol in the scripting/programming language of your choice. You need to make a quick change to your Azure file share from on-the-go, such as from a laptop without SMB access, tablet, or mobile device. You need to execute a script or application from a client which cannot mount an SMB share, such as on-premises clients, which do not have port 445 unblocked. You are taking advantage of serverless resources, such as Azure Functions. The following examples show how to use the Azure portal to manipulate your Azure file share with the File REST protocol. Now that you have created an Azure file share, you can mount the file share with SMB on Windows, Linux, or macOS. Alternatively, you can work with your Azure file share with the Azure portal. On the File Service page, select the myshare file share. The page for your file share opens. On the menu at the top of the page, select + Add directory. The New directory page drops down. Type myDirectory and then click OK.
Click on the myDirectory directory. The myDirectory panel opens. In the menu at the top, click Upload. The Upload files panel opens. Click on the folder icon to open a window to browse your local files. Select a file and then click Open. In the Upload files page, verify the file name and then click Upload. When finished, the file should appear in the list on the myDirectory page. You can download a copy of the file you uploaded by right-clicking on the file. After clicking the download button, the exact experience will depend on the operating system and browser you're using.